Scars are often used to identify manatees. The Science Issue and Relevance: Photographic documentation of individual manatees has resulted in a legacy database consisting of more than 90,000 sighting records for more than 3,800 manatees. Mark-recapture models utilize these data to estimate adult survival and reproduction and are the basis for assessing status of the endangered Florida manatee population. The data have enabled us to document manatee site fidelity and habitat use in Florida, and long-distance movements of manatees to as far as Cape Cod, Massachusetts, Cuba and the Bahamas. Images and data in MIPS also have facilitated the identification of rescued manatees and manatee carcasses. Genetic fingerprints are providing a second means to monitor individual identification and lineages of these manatees. Methodology for Addressing the Issue: The USGS maintains manatee sighting data from throughout the Southeastern United States. The photo-documentation effort began in 1978 when the Florida manatee population was estimated at less than 1,000. Growth of the population to the current estimate of more than 6,000, along with the conversion to digital technology, has generated an invaluable dataset of greatly more than 750,000 images with metadata. To archive, access, and enable analyses of these data, we developed the Manatee Individual Photo-identification System (MIPS) database. MIPS is shared with partners at the Florida Fish and Wildlife Conservation Commission and Mote Marine Laboratory via encrypted USGS servers. USGS staff, partners, and cooperators collect data following precise USGS protocols. To facilitate matches to rescued and deceased manatees, rehabilitation facilities provide images of rescued manatees and FWC provides carcass images. A research diver photographs a manatee. Future Steps: MIPS analyses are underway to examine variations in manatee distribution, survival, and reproduction, which may be related to changes in the environment as a result of local stressors or global climate change. Several collaborations also are underway to integrate MIPS data with manatee genetic data to jointly analyze MIPS identity and lineage data, to estimate annual survival rates of calves and subadults, and to assess the rate of acquisition of new scars in relation to management actions (such as the implementation of sanctuaries and regulation of boat speeds). The medical community also has expressed an interest in the documentation of wound healing in manatees using the extensive individual image records in MIPS. Related Projects: Application of manatee capture-recapture statistical models to study population changes (USGS); Florida manatee genetic analysis (USGS); Estimates of non-lethal boat strikes on Florida manatees (USGS); Manatee health assessments (USGS); Modeling winter carrying capacity of the Florida manatee (USGS); Manatee mortality database (FWC); Captive manatee rescue and rehabilitation database (FWS, FWC). Beck, CA, A Clark. 2012. Individual Identification of Sirenians, Chapter 15 in Sirenian Conservation: Issues and Strategies in Developing Countries. Rood, KA, SL Barton, CA Beck. 2012. Partnering for Success: Florida Manatee Photo-identification. Box Essay in Chapter 3, Regional Issues in Sirenian Conservation, in Sirenian Conservation: Issues and Strategies in Developing Countries. Kendall, W.L., R.J. Barker, G.C. White, M.S. Lindberg, C.A. Langtimm, and C.L. Peñaloza. Combining tag recovery, auxiliary observations, and robust design data to estimate demographic parameters from marked individuals. 2013. Methods in Ecology and Evolution 4:828-835. Alvarez-Aleman, Anmari; Beck, Cathy A.; Powell, James A. 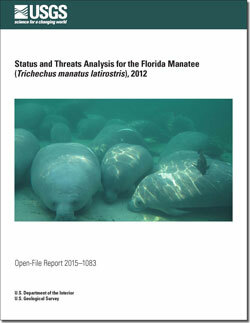 First report of a Florida Manatee (Trichechus manatus latirostris) in Cuba; 2010; Article; Journal; Aquatic Mammals; Alvarez-Aleman, Anmari ; Beck, Cathy A.; Powell, James A.
Langtimm, C.A. ; Krohn, M.D. ; Reid, J.P.; Stith, B.M. ; Beck, C.A. Possible effects of the 2004 and 2005 hurricanes on manatee survival rates and movement; 2006; Article; Journal; Estuaries and Coasts; Langtimm, C. A.; Krohn, M. D.; Reid, J. P.; Stith, B. M.; Beck, C. A.
Kendall, W.L. ; Langtimm, C.A. ; Beck, C.A. ; Runge, M.C. Capture-recapture analysis for estimating manatee reproductive rates; 2004; Article; Journal; Marine Mammal Science; Kendall, W.L. ; Langtimm, C.A. ; Beck, C.A. ; Runge, M.C. Langtimm, C.A. ; Beck, C.A. ; Edwards, H.H. ; Fick-Child, K. J.; Ackerman, B.B. ; Barton, S.L. ; Hartley, W.C. Survival estimates for Florida manatees from the photo-identification of individuals; 2004; Article; Journal; Marine Mammal Science; Langtimm, C. A.; Beck, C. A.; Edwards, H. H.; Fick-Child, K. J.; Ackerman, B. B.; Barton, S. L.; Hartley, W. C.
Lower survival probabilities for adult Florida manatees in years with intense coastal storms; 2003; Article; Journal; Ecological Applications; Langtimm, C. A.; Beck, C. A.